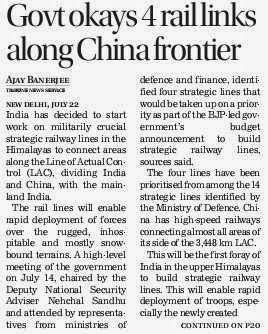 India has decided to start work on militarily crucial strategic railway lines in the Himalayas to connect areas along the Line of Actual Control (LAC), dividing India and China, with the mainland India. The rail lines will enable rapid deployment of forces over the rugged, inhospitable and mostly snow-bound terrains. A high-level meeting of the government on July 14, chaired by the Deputy National Security Adviser Nehchal Sandhu and attended by representatives from ministries of defence and finance, identified four strategic lines that would be taken up on a priority as part of the BJP-led government’s budget announcement to build strategic railway lines, sources said. The four lines have been prioritised from among the 14 strategic lines identified by the Ministry of Defence. China has high-speed railways connecting almost all areas of its side of the 3,448 km LAC. This will be the first foray of India in the upper Himalayas to build strategic railway lines. This will enable rapid deployment of troops, especially the newly created Mountain Strike Corps mandated to face China. The railway line being built in Kashmir has a dual purpose - socio-economic and strategic. The other existing narrow gauge lines in Himachal Pradesh and Northern Bengal are of British vintage. The most important railway lines will connect Leh in Jammu and Kashmir and Tawang in Arunachal Pradesh with the mainland India. Both these are on the LAC. The other two routes will connect one of the remotest parts of Arunachal Pradesh and facilitate easier military movement between other north-eastern states and Arunachal Pradesh. 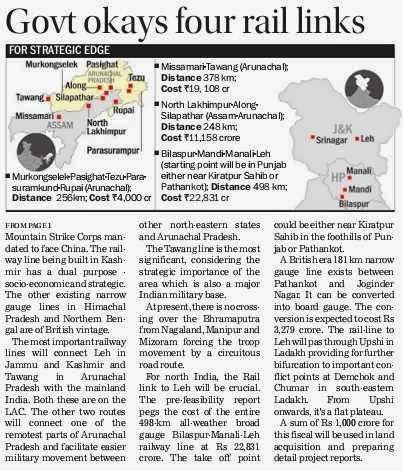 The Tawang line is the most significant, considering the strategic importance of the area which is also a major Indian military base. At present, there is no crossing over the Bhramaputra from Nagaland, Manipur and Mizoram forcing the troop movement by a circuitous road route. For north India, the Rail link to Leh will be crucial. The pre-feasibility report pegs the cost of the entire 498-km all-weather broad gauge Bilaspur-Manali-Leh railway line at Rs 22,831 crore. The take off point could be either near Kiratpur Sahib in the foothills of Punjab or Pathankot. A British era 181 km narrow gauge line exists between Pathankot and Joginder Nagar. It can be converted into board gauge. The conversion is expected to cost Rs 3,279 crore. The rail-line to Leh will pas through Upshi in Ladakh providing for further bifurcation to important conflict points at Demchok and Chumar in south-eastern Ladakh. From Upshi onwards, it's a flat plateau. A sum of Rs 1,000 crore for this fiscal will be used in land acquisition and preparing detail project reports. Pakistan-backed terrorists struck 700 meters inside the Indian territory along the Line of Control (LoC) in the Pallanwala area of the Akhnoor sector today killing an Armyman in exchange of fire. The BSF also foiled an intrusion bid last evening by killing a Pakistani intruder in the Hiranagar sub-sector along the International Border in Kathua district. The intruder was leading a group of ultras. 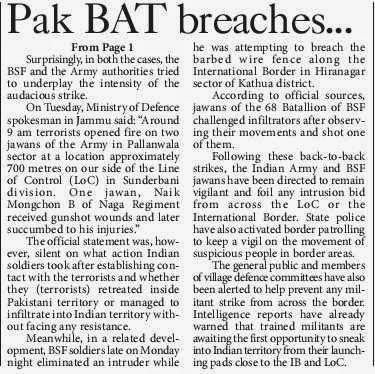 While the Army claimed it to be a group of infiltrating militants, the possibility of the involvement of Pakistan’s Border Action Team (BAT) cannot be ruled out. 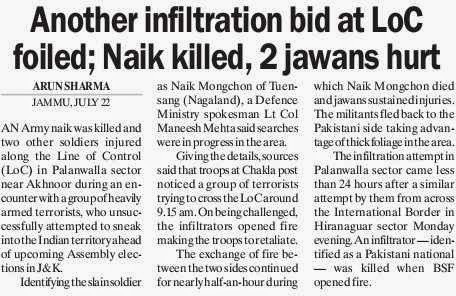 The martyred soldier has been identified as Naik Mongchon B of Naga Regiment, a native of Tuensang in Nagaland. On May 18, a soldier was killed in a suspected Pak BAT attack in the Jogwan forward area along the LoC in the Akhnoor sector. Three Indian security personnel have been killed on the frontiers of the Jammu region since the Narendra Modi government took over on May 26. On June 12, a soldier was killed and seven others, including a Major, were injured in two IED blasts in the Tarkundi area of the Balakote sector along the LoC in the Poonch sector. On July 16, a BSF jawan — constable Sanjay Dhar — was killed while three Bihari labourers and a local youth were injured in Ranger’s fire in Arnia. “Today around 9 am, there was an infiltration bid in the Kachrial area of the Pallanwala sector in Akhnoor by a group of ultras. In the ensuing gunfight, we lost a trooper when the group was being repulsed,” said Jammu-based defence spokesperson Lt Col Manish Mehta. He said the operation was still on. “The Army has cordoned off the area and a search operation has been launched,” he added. Col Mehta said the terrorists opened fire on two soldiers this morning in the Pallanwala sector at a location approximately 700 metres on the Indian side of the LoC. 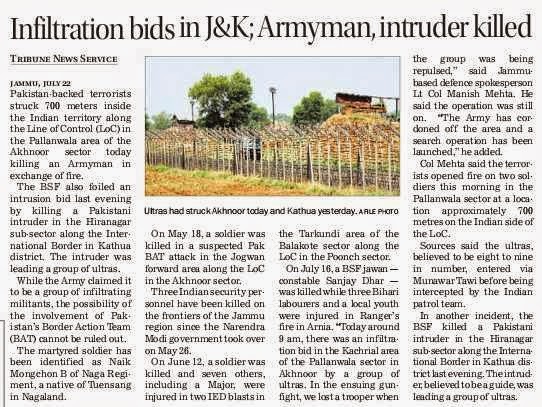 Sources said the ultras, believed to be eight to nine in number, entered via Munawar Tawi before being intercepted by the Indian patrol team. In another incident, the BSF killed a Pakistani intruder in the Hiranagar sub-sector along the International Border in Kathua district last evening. The intruder, believed to be a guide, was leading a group of ultras. 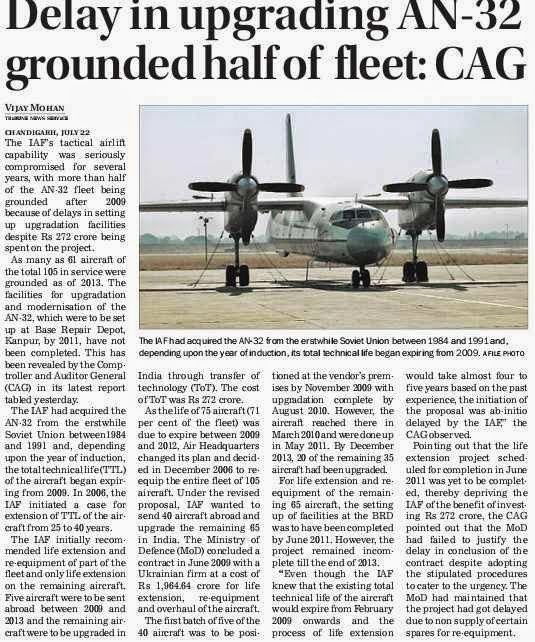 The IAF’s tactical airlift capability was seriously compromised for several years, with more than half of the AN-32 fleet being grounded after 2009 because of delays in setting up upgradation facilities despite Rs 272 crore being spent on the project. As many as 61 aircraft of the total 105 in service were grounded as of 2013. The facilities for upgradation and modernisation of the AN-32, which were to be set up at Base Repair Depot, Kanpur, by 2011, have not been completed. This has been revealed by the Comptroller and Auditor General (CAG) in its latest report tabled yesterday. The IAF had acquired the AN-32 from the erstwhile Soviet Union between1984 and 1991 and, depending upon the year of induction, the total technical life (TTL) of the aircraft began expiring from 2009. In 2006, the IAF initiated a case for extension of TTL of the aircraft from 25 to 40 years. The IAF initially recommended life extension and re-equipment of part of the fleet and only life extension on the remaining aircraft. Five aircraft were to be sent abroad between 2009 and 2013 and the remaining aircraft were to be upgraded in India through transfer of technology (ToT). The cost of ToT was Rs 272 crore. As the life of 75 aircraft (71 per cent of the fleet) was due to expire between 2009 and 2012, Air Headquarters changed its plan and decided in December 2006 to re-equip the entire fleet of 105 aircraft. Under the revised proposal, IAF wanted to send 40 aircraft abroad and upgrade the remaining 65 in India. The Ministry of Defence (MoD) concluded a contract in June 2009 with a Ukrainian firm at a cost of Rs 1,964.64 crore for life extension, re-equipment and overhaul of the aircraft. The first batch of five of the 40 aircraft was to be positioned at the vendor’s premises by November 2009 with upgradation complete by August 2010. However, the aircraft reached there in March 2010 and were done up in May 2011. By December 2013, 20 of the remaining 35 aircraft had been upgraded. For life extension and re-equipment of the remaining 65 aircraft, the setting up of facilities at the BRD was to have been completed by June 2011. However, the project remained incomplete till the end of 2013. “Even though the IAF knew that the existing total technical life of the aircraft would expire from February 2009 onwards and the process of life extension would take almost four to five years based on the past experience, the initiation of the proposal was ab-initio delayed by the IAF,” the CAG observed. Pointing out that the life extension project scheduled for completion in June 2011 was yet to be completed, thereby depriving the IAF of the benefit of investing Rs 272 crore, the CAG pointed out that the MoD had failed to justify the delay in conclusion of the contract despite adopting the stipulated procedures to cater to the urgency. The MoD had maintained that the project had got delayed due to non supply of certain spares for re-equipment. IT is a pity that India refused to have any truck with Gulbuddin Hekmatyar who was Pakistan's confidante. No doubt, he is a nasty person to deal with, but if we had fixed our eyes on the situation a decade later, we should have swallowed some of his anti-India rhetoric. But all this is now history. The two countries, particularly India, should formulate some strategy to thwart the Taliban onslaught, which is bound to take place once they are sure that the Western forces are not in a position to match their weapons. I find it strange that New Delhi is not seriously considering the pros and cons of what happens once the American and NATO forces reduce their presence in Afghanistan only in the shape of a few thousand troops. US Secretary of State Kerry has visited Kabul to devise the policy after the withdrawal. But New Delhi is not in the picture. No doubt, the Afghans have the best goodwill towards India because it has helped them set up hospitals, schools and build roads. Yet Islamabad, which considers Afghanistan its “strategic depth,” wants the country to be its satellite. New Delhi has tried to persuade Islamabad to let Kabul be independent and sovereign, but Pakistan has not bitten the bullet. It all started when the Soviet Union sent its forces to Afghanistan to impose their ideology on a state which was saturated with Islamic ideas. America used the opportunity to bleed the Soviet Union by training the fundamentalists in Pakistan to make inroads into Afghanistan without considering the long-term repercussions. And once the Soviet Union started retreating from Afghanistan, Washington lost all interests in the territory leaving behind arms and other equipment in the field itself. The fundamentalists used those weapons to propagate their strict and disciplinarian interpretation of Islam. Islamabad had in its mind the armed and trained Taliban against India and there are numerous examples to testify that the insurgency in Kashmir was nothing but a byproduct of a bigoted stance to shut out the participation of non-Muslims in governance, however unwittingly demanded. I recall when I met in Kabul a leader from the Masud group, anti-Taliban in ideology and pro-India in its approach, he told me that the road to Kabul goes through Islamabad and if New Delhi is really interested in stopping the tide of fundamentalists, it should have a serious dialogue with Pakistan. The most disconcerting aspect is the birth of Tehrik-e-Pakistan Taliban (TTP), an indigenous group which is in a position to strike wherever it wants and whenever it wants. It has proved this again and again. 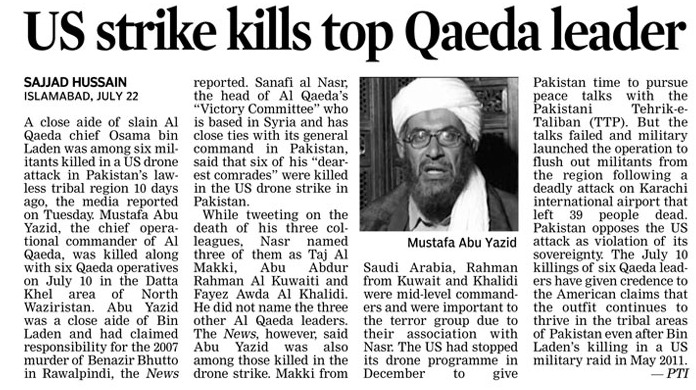 The recent attack on Karachi airport is an example. However, the Karachi happening is only the symptom, not the disease. The disease is fundamentalism which, to the horror of even middle-of-the-road Pakistanis, is spreading rapidly. Prime Minister Nawaz Sharif has opted for an easy path. He has been negotiating with the Taliban to accommodate their aspirations. The reason why the talks have not gone very far is that the Taliban's insistence on Pakistan giving proof of its sincerity of taking measures like closing institutions for female literacy and making “hijab” (veil) a compulsory outfit for women in Pakistan. No doubt the next step they would demand is a ban on women car drivers, just like in Saudi Arabia. Music has already been sacrificed on the altar of extremism. The old-time singers or instrument players have no market in Pakistan. How ironic that they come to India to earn a livelihood. The past, however bitter, should not now be recalled at a time when both India and Pakistan have a few option except to organise a joint front to defeat the Taliban. New Delhi should not forget that the Taliban would be at the Attari (Amritsar) border if they are not defeated in Afghanistan itself. If it is embarrassing for the two countries to talk about their strategy in the open, they can establish a back channel as they have done in the case of Kashmir. The repercussions of the Taliban gaining the upper hand, first in Afghanistan and then in Pakistan, are so inimical to the defence and development of India that it should go out of the way to befriend Pakistan on a joint approach towards Afghanistan. Since no serious talk takes place between the two because of Kashmir, they should keep this problem aside and allow the two army chiefs to sit across the table and devise a long-term strategy which would enable Afghanistan to stay independent. Zulfikar Ali Bhutto, otherwise liberal, was the person who began placating the fanatics. He is the one who started a government stipend for the head maulvis in mosques and declared Ahmediays as non-Muslim. Today the graves of Ahmediyas are being dug and the remains of whatever is left are thrown out. The Pakistan establishment did not think even for a minute in humiliating Sir Zafrullah Khan, a prominent Ahmediaya, who turned the tables against India at the UN on Kashmir. In fact, the complaint which Prime Minister Jawaharlal Nehru made at the UN about “Pakistan's aggression” in Kashmir went against New Delhi largely because of his efforts, blessed by Britain. Of course, this means that Islamabad would have to change its policy and not consider Afghanistan their “strategic depth.” This is in Pakistan’s own interest. The manner in which the Taliban have begun to count in the affairs of Pakistan should be a warning that the Taliban would not allow Pakistan to be a liberal Islamic state. It is being interpreted that India is not seeing the writing on the wall. At least Prime Minister Narendra Modi, said to be a strong ruler, should pick up the threads with Nawaz Sharif on his matter. Both hit it off well when they met in Delhi. Nawaz Sharif has even said so in a letter to Modi. Can things in the same vein go ahead in the interest of policy to contain Talibanisation, already quite assertive in Pakistan? New Delhi should take the initiative to get America on board regarding anti-Taliban policy. If and when they are defeated in their designs both in Afghanistan and Pakistan, they would cease to be a force which is beginning to loom large in other Islamic countries where the Taliban-like thoughts have begun to assert themselves. 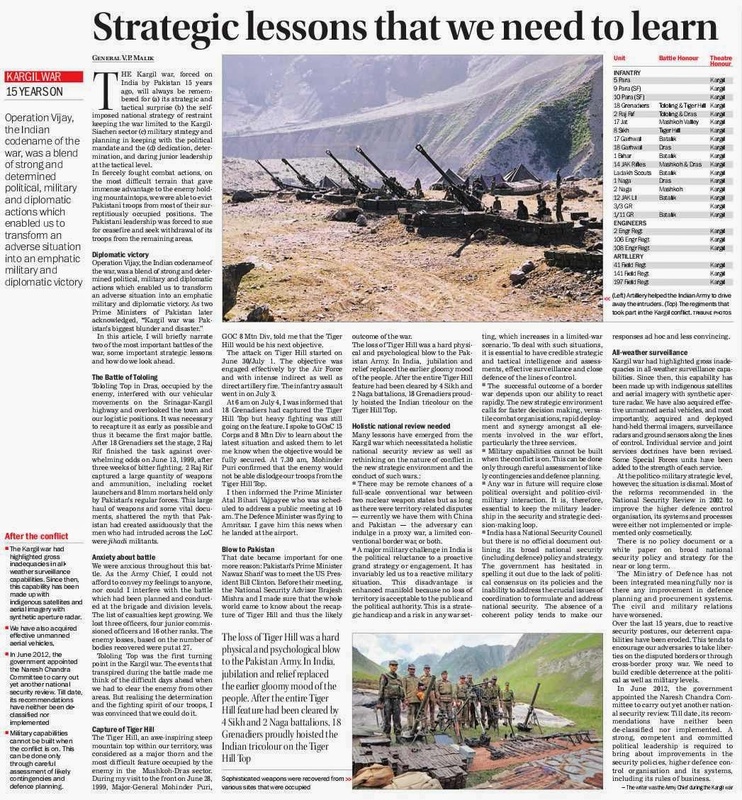 THE Kargil war, forced on India by Pakistan 15 years ago, will always be remembered for (a) its strategic and tactical surprise (b) the self-imposed national strategy of restraint keeping the war limited to the Kargil-Siachen sector (c) military strategy and planning in keeping with the political mandate and the (d) dedication, determination, and daring junior leadership at the tactical level. In fiercely fought combat actions, on the most difficult terrain that gave immense advantage to the enemy holding mountaintops, we were able to evict Pakistani troops from most of their surreptitiously occupied positions. The Pakistani leadership was forced to sue for ceasefire and seek withdrawal of its troops from the remaining areas. In this article, I will briefly narrate two of the most important battles of the war, some important strategic lessons and how do we look ahead. Tololing Top in Dras, occupied by the enemy, interfered with our vehicular movements on the Srinagar-Kargil highway and overlooked the town and our logistic positions. It was necessary to recapture it as early as possible and thus it became the first major battle. After 18 Grenadiers set the stage, 2 Raj Rif finished the task against overwhelming odds on June 13, 1999, after three weeks of bitter fighting. 2 Raj Rif captured a large quantity of weapons and ammunition, including rocket launchers and 81mm mortars held only by Pakistan's regular forces. This large haul of weapons and some vital documents, shattered the myth that Pakistan had created assiduously that the men who had intruded across the LoC were jihadi militants. We were anxious throughout this battle. As the Army Chief, I could not afford to convey my feelings to anyone, nor could I interfere with the battle which had been planned and conducted at the brigade and division levels. The list of casualties kept growing. We lost three officers, four junior commissioned officers and 16 other ranks. The enemy losses, based on the number of bodies recovered were put at 27. Tololing Top was the first turning point in the Kargil war. The events that transpired during the battle made me think of the difficult days ahead when we had to clear the enemy from other areas. But realising the determination and the fighting spirit of our troops, I was convinced that we could do it. The Tiger Hill, an awe-inspiring steep mountain top within our territory, was considered as a major thorn and the most difficult feature occupied by the enemy in the Mushkoh-Dras sector. During my visit to the front on June 28, 1999, Major-General Mohinder Puri, GOC 8 Mtn Div, told me that the Tiger Hill would be his next objective. The attack on Tiger Hill started on June 30/July 1. The objective was engaged effectively by the Air Force and with intense indirect as well as direct artillery fire. 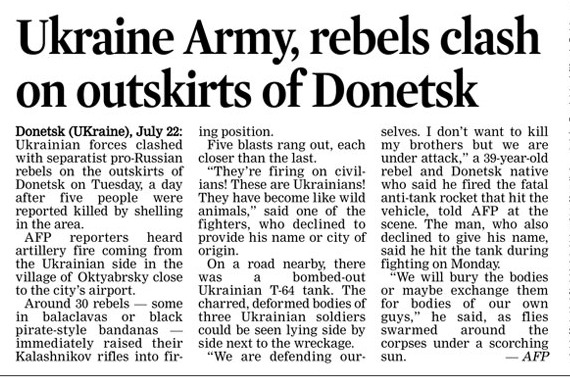 The infantry assault went in on July 3. At 6 am on July 4, I was informed that 18 Grenadiers had captured the Tiger Hill Top but heavy fighting was still going on the feature. I spoke to GOsC 15 Corps and 8 Mtn Div to learn about the latest situation and asked them to let me know when the objective would be fully secured. At 7.30 am, Mohinder Puri confirmed that the enemy would not be able dislodge our troops from the Tiger Hill Top. I then informed the Prime Minister Atal Bihari Vajpayee who was scheduled to address a public meeting at 10 am. The Defence Minister was flying to Amritsar. I gave him this news when he landed at the airport. That date became important for one more reason: Pakistan's Prime Minister Nawaz Sharif was to meet the US President Bill Clinton. Before their meeting, the National Security Advisor Brajesh Mishra and I made sure that the whole world came to know about the recapture of Tiger Hill and thus the likely outcome of the war. The loss of Tiger Hill was a hard physical and psychological blow to the Pakistan Army. In India, jubilation and relief replaced the earlier gloomy mood of the people. After the entire Tiger Hill feature had been cleared by 4 Sikh and 2 Naga battalions, 18 Grenadiers proudly hoisted the Indian tricolour on the Tiger Hill Top. n There may be remote chances of a full-scale conventional war between two nuclear weapon states but as long as there were territory-related disputes — currently we have them with China and Pakistan — the adversary can indulge in a proxy war, a limited conventional border war, or both. 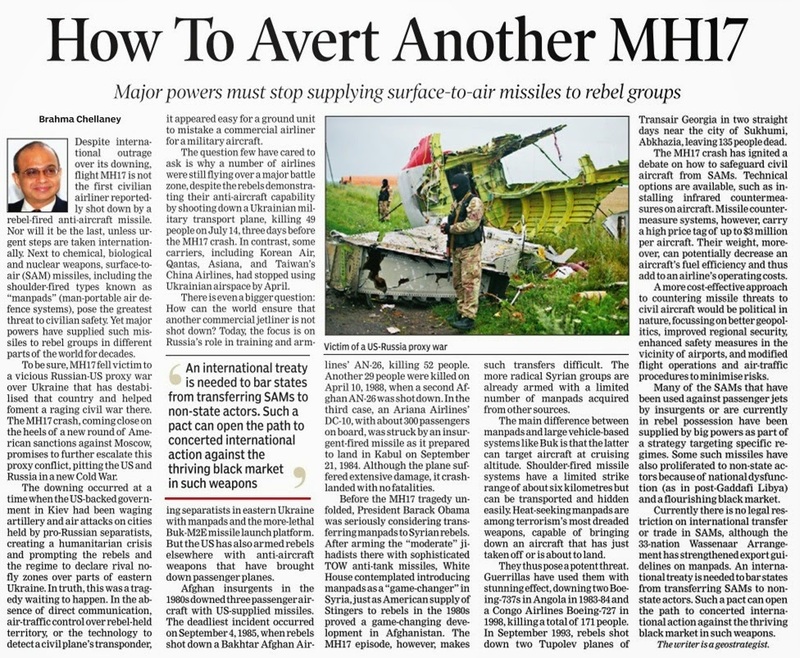 n A major military challenge in India is the political reluctance to a proactive grand strategy or engagement. It has invariably led us to a reactive military situation. This disadvantage is enhanced manifold because no loss of territory is acceptable to the public and the political authority. This is a strategic handicap and a risk in any war setting, which increases in a limited-war scenario. 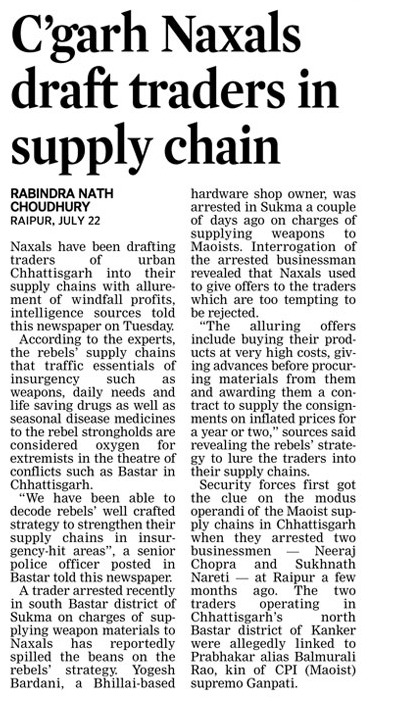 To deal with such situations, it is essential to have credible strategic and tactical intelligence and assessments, effective surveillance and close defence of the lines of control. n The successful outcome of a border war depends upon our ability to react rapidly. The new strategic environment calls for faster decision making, versatile combat organisations, rapid deployment and synergy amongst all elements involved in the war effort, particularly the three services. n Military capabilities cannot be built when the conflict is on. This can be done only through careful assessment of likely contingencies and defence planning. n Any war in future will require close political oversight and politico-civil-military interaction. It is, therefore, essential to keep the military leadership in the security and strategic decision-making loop. n India has a National Security Council but there is no official document outlining its broad national security (including defence) policy and strategy. The government has hesitated in spelling it out due to the lack of political consensus on its policies and the inability to address the crucial issues of coordination to formulate and address national security. The absence of a coherent policy tends to make our responses ad hoc and less convincing. Kargil war had highlighted gross inadequacies in all-weather surveillance capabilities. Since then, this capability has been made up with indigenous satellites and aerial imagery with synthetic aperture radar. We have also acquired effective unmanned aerial vehicles, and most importantly, acquired and deployed hand-held thermal imagers, surveillance radars and ground sensors along the lines of control. Individual service and joint services doctrines have been revised. Some Special Forces units have been added to the strength of each service. At the politico-military strategic level, however, the situation is dismal. Most of the reforms recommended in the National Security Review in 2002 to improve the higher defence control organisation, its systems and processes were either not implemented or implemented only cosmetically. There is no policy document or a white paper on broad national security policy and strategy for the near or long term. The Ministry of Defence has not been integrated meaningfully nor is there any improvement in defence planning and procurement systems. The civil and military relations have worsened. Over the last 15 years, due to reactive security postures, our deterrent capabilities have been eroded. This tends to encourage our adversaries to take liberties on the disputed borders or through cross-border proxy war. We need to build credible deterrence at the political as well as military levels. In June 2012, the government appointed the Naresh Chandra Committee to carry out yet another national security review. 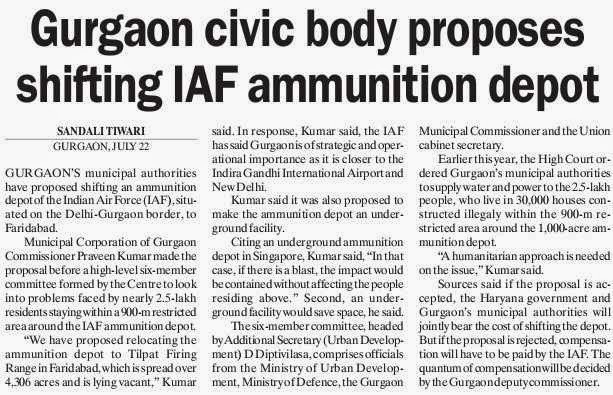 Till date, its recommendations have neither been de-classified nor implemented. A strong, competent and committed political leadership is required to bring about improvements in the security policies, higher defence control organisation and its systems, including its rules of business. The Kargil war had highlighted gross inadequacies in all-weather surveillance capabilities. Since then, this capability has been made up with indigenous satellites and aerial imagery with synthetic aperture radar. Military capabilities cannot be built when the conflict is on. This can be done only through careful assessment of likely contingencies and defence planning. NEW DELHI: An internal review by the Ministry of Defence (MoD) has found major lacunae in the way the Army Commanders are using the financial powers delegated to them. 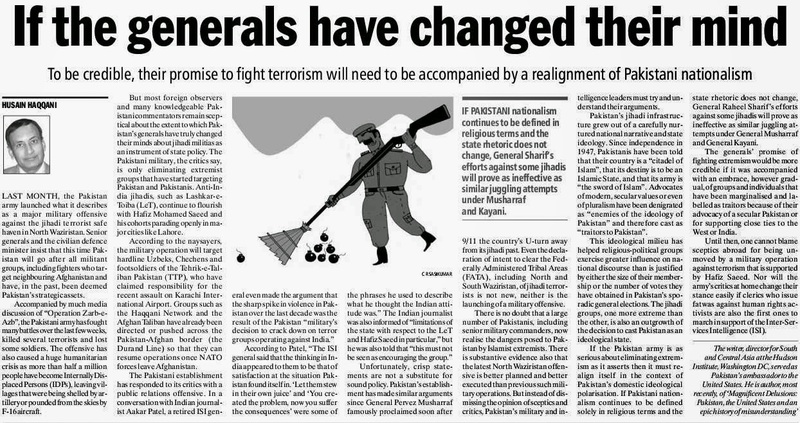 And it has led to serious differences between the military top brass and bureaucrats on the matter of enhancing financial powers (of Army Commanders). 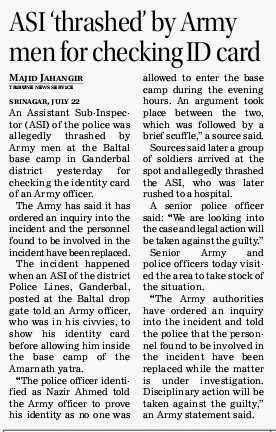 The report comes at time when the Army Headquarters (HQ) has sought a hike in their financial powers to buy necessary equipment and supplies for troopers on operational deployment in the insurgency-hit North-East and Jammu and Kashmir. But an extensive review of the delegation of financial powers, carried out by the Defence Finance Department, pointed out that senior military officers circumvent the Budgetary caps, primarily due to lack of checks and balances in the existing system of Integrated Financial Advisers (IFAs) introduced in 2006 under the UPA regime. To tighten the screws on expenses under the delegated powers, the committee has recommended that the Army, apart from adopting e-procurement system using information technology, should also introduce e-concurrence system for approvals for the expenses. A 95-page report of the Committee on Review of Delegation of Powers under the MoD (Finance) was submitted to Defence Secretary R K Mathur earlier this month. The panel was set up on January 23. A copy of the report was accessed by Express. The need for a review was felt after demands for expanding the scope of their financial powers were made by the Army Commanders. 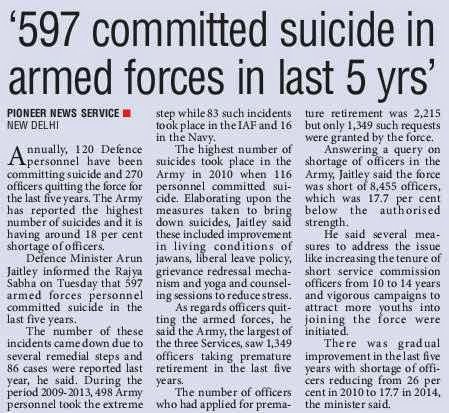 But, recent internal audits by the Ministry of Defence threw up cases, where the use of financial powers were not in conformity with the spirit of the June 2006 government order enhancing the financial powers of the Armed Forces, according to sources. The review committee’s report noted that in all, 192 special audits were conducted in 2011-12 by the Controller General of Defence Accounts (CGDA), which made 864 observations that could be considered as deviations or circumventing of the cap in financial powers ordered in 2006. Among the observations made by the CGDA was the “splitting of requirements (by the Army) to enable processing (the purchases) under powers of lower Competent Financial Authority (CFA) or under inherent powers of the CFAs without the IFA’s concurrence,” the report said. Other deficiencies observed by the internal audits, include procurement in excess of entitlement and incorrect assessment of requirement. In some cases, there was no proper use of costing methodology, due to which there was failure in undertaking price benchmarking. Most of these illustrations have been brought out as case studies by the Comptroller and Auditor General (CAG) reports of the past few years, the report said. Suggesting that there was a need to tighten the way the Armed Forces use their financial powers, the committee has proposed greater ministry oversight in the matter, which would mean more involvement of the bureaucrats in scrutinising the way the Army officers purchase equipment that are needed urgently. It has also proposed that the Army makes use of information technology that could enable “transparency, equity, efficiency and accountability” in the processes under delegated powers, particularly procurement-related activities. “Therefore, e-procurement, which has already been mandated by the government using the software package developed by the National Informatics Centre, should be introduced in a time-bound manner,” the committee has proposed. “In addition, e-concurrence has been recommended as a way forward to meet the needs of the Services to provide Integrated Financial Advisers system coverage, particularly in remote and far-flung locations,” it said and added that the existing IFA system needed to be consolidated instead of going in for further expansion. 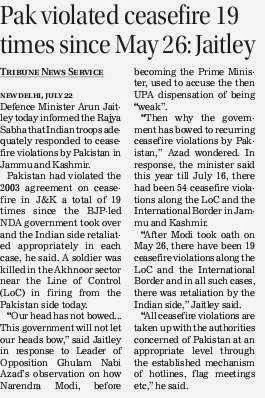 Defence Minister Arun Jaitley on Tuesday said the army has been giving befitting replies to ceasefire violations by Pakistan. 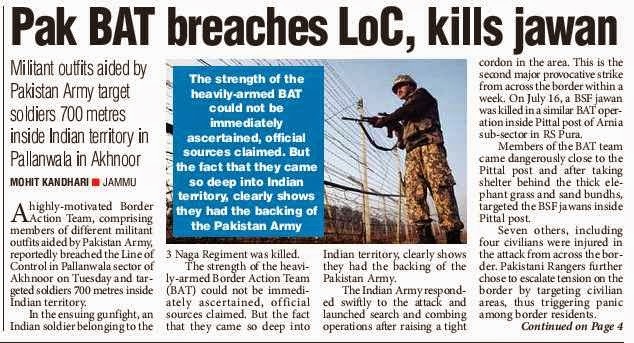 "Indian Army has given befitting reply to Pakistan's repeated attempts of ceasefire violations along the LoC. India will keep retaliating to such violations," Mr Jaitley told the Rajya Sabha on Tuesday. "India won't and will never bow down," he said. 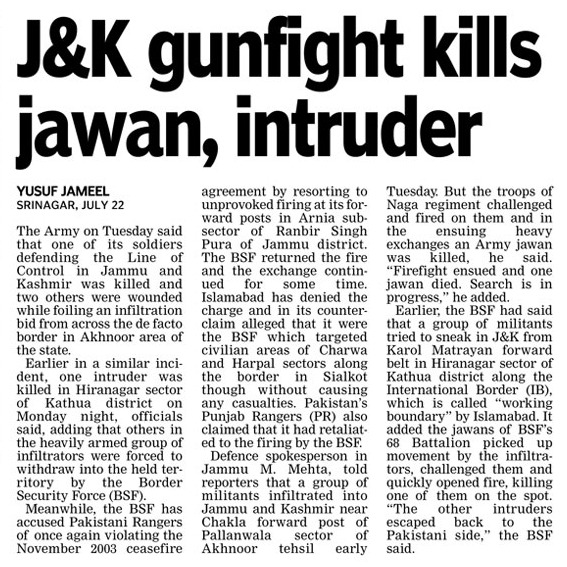 A soldier was killed in ceasefire violation by Pakistan in the Akhnoor sector of Jammu and Kashmir on Tuesday. 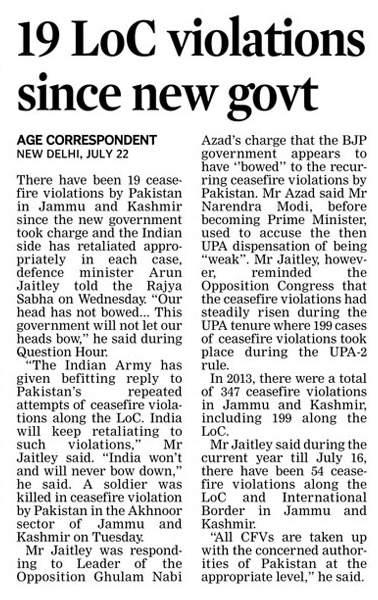 Mr Jaitley informed the House that 199 cases of ceasefire violations took place during the UPA-II regime. Replying to supplementaries during question hour, the defence minister also said the government is ready to provide compensation to the people in villages located near the LoC for damage caused to their houses in firing across the border. "Government will also provide financial assistance to the farmers, who are unable to make use of their land for agriculture following cross border firing," Mr Jaitley said. "During past two months period of Modi government, Pakistan has violated ceasefire 25 times," said Leader of Opposition Ghulam Nabi Azad.